Incoming 4th graders are typically nine years old, each progressing through a range of characteristics that should be considered. When thinking about 4th grade lessons, keep in mind the typical abilities and characteristics of not only nine year olds, but how those needs change as they transition to ten. Drawing on decades of educational experience and a wealth of research, Yardsticks invites every adult who teaches or cares for children to celebrate the incredible developmental journey that occurs from ages four through fourteen. 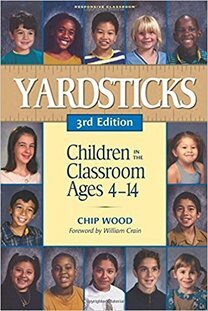 Combining easy-to-access information about the cognitive, social-emotional, and physical characteristics unique to each age with practical advice for how to apply this knowledge, Yardsticks offers parents and educators a foundation for helping children grow and thrive. Able to manage more than one concept at a time, such as "long ago and far away"